Quick drying, fast build up, economical to use, peels easily from model, flexible and stretchable, harmless to most surfaces! Now you can duplicate figurines, sculptures and other items with safe, brushable latex rubber. 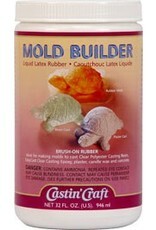 Mold Builder will not stick to metal, clay, ceramics, plaster, wood or Plasticine clay. 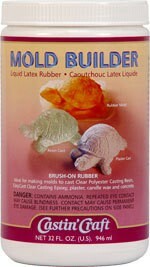 Mold Builder molds are durable, reusable, and economical to make. The molds you make from Mold Builder can be used to cast paper, plaster, candle wax, soap, casting resin or casting epoxy.